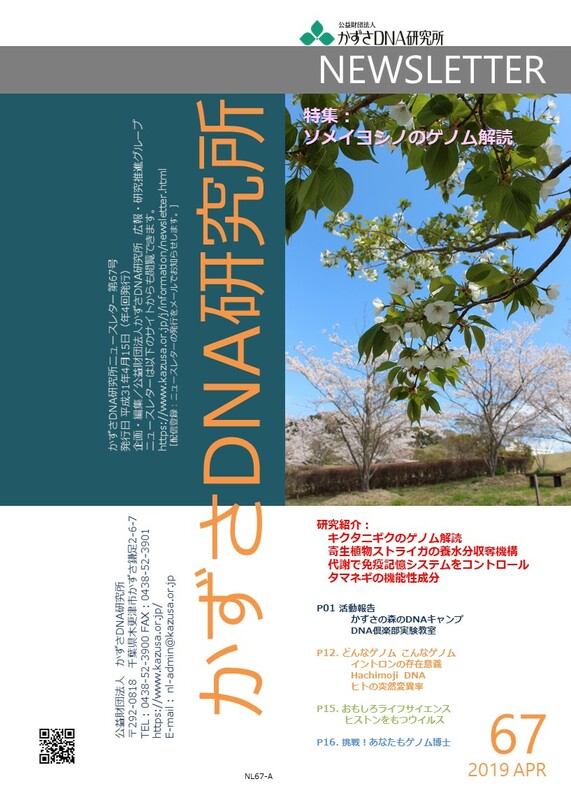 ソメイヨシノのゲノム解読 Phased genome sequence of an interspecific hybrid flowering cherry, SomeiYoshino ( Cerasus x yedoensis ). キクタニギクのゲノム解読 e novo whole-genome assembly in Chrysanthemum seticuspe, a model species of Chrysanthemums, and its application to genetic and gene discovery analysis. 寄生植物ストライガの養水分収奪機構 Aberrant protein phosphatase 2C leads to abscisic acid insensitivity and high transpiration in parasitic Striga. 代謝で免疫記憶システムをコントロール ACC1 determines memory potential of individual CD4+ T cells by regulating de novo fatty acid biosynthesis. タマネギの機能性成分 Widely targeted metabolome and transcriptome landscapes of Allium fistulosum–A. cepa chromosome addition lines revealed a flavonoid hot spot on chromosome 5A. イントロンの存在意義 Intron RNA sequences help yeast cells to survive starvation. Edwards SR & Johnson TL. Hachimoji DNA Hachimoji DNA and RNA: A genetic system with eight building blocks. ヒトの突然変異率 Characterizing mutagenic effects of recombination through a sequence-level genetic map. DOI: 10.1126/science.aaw8705Ancient genomes from Iceland reveal the making of a human population. DOI: 10.1126/science.aar2625The Making of a Human Population Uncovered Through Ancient Icelandic Genomes. ヒストンをもつウイルス AMedusavirus, a novel large DNA virus discovered from hot spring water.